Folio Method is a radiographic procedure to best demonstrate Sprain or tearing of ulnar collateral ligament of thumb at the MCP joint as a result of acute hyper extension of thumb. It is also known as the PA Stress Skiers Thumb projection. Seat patient at end of table with both hand extended and pronated on IR. Position both hands side by side to center of cassette, rotated laterally into more or less 45degrees oblique position, resulting in true PA projection of both thumbs. Place support as needed under both wrist and proximal thumb regions to prevent motion. 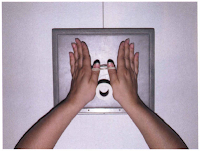 Ensure that hands are rotated enough to thumb parallel to IR (cassette) for true PA projection of both thumbs. Place round spacer, such as a roll of medical tape, between proximal thumb regions; wrap rubber bands around distal thumbs as shown. Immediately before exposure, ask patient to pull thumbs apart firmly and hold. Note: Explain procedure carefully to patient and observe patient while applying tension on rubber band without motion before initiating exposure. Work quickly because this can be painful for patient. Collimate on four sides to include second metacarpals and entire thumbs, from CMC joints proximally to distal phalanges distally. Entire thumbs from second metacarpals to distal phalanges. 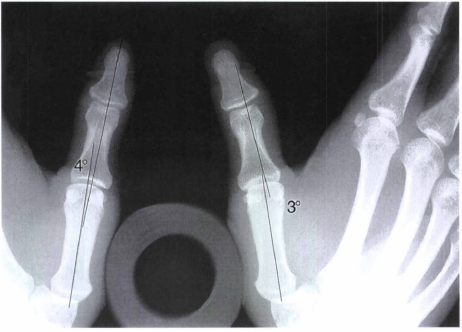 Demonstrates metacarpophalangeal angles and joint spaces at MCP joints. MCP and IP joints appear open, indicating that thumbs were parallel to IR and perpendicular to CR. No rotation of thumbs as evidenced by symmetric appearance of concavities of shafts of first metacarpals and phalanges. 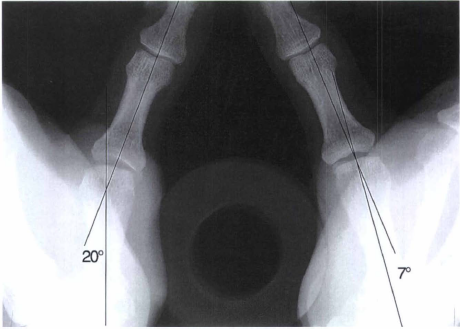 Distal phalanges should appear to be pulled together, indicating that tension was applied. CR and center of collimation field should be Midway between the two MCP joints. Optimal density and contrast with no motion demonstrates soft tissue margins and clear, sharp bony edges and trabecular markings.